This form is meant to gather some preliminary information about your cabinetry needs. MidSouth will of course meet with you to go over design details, materials, cost, etc. for your project(s). Please fill out the form and we will get back in touch with you as soon as possible. 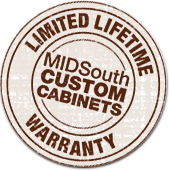 This information is NOT shared with any 3RD parties, and is used solely for MidSouth Custom Cabinets to assist you.